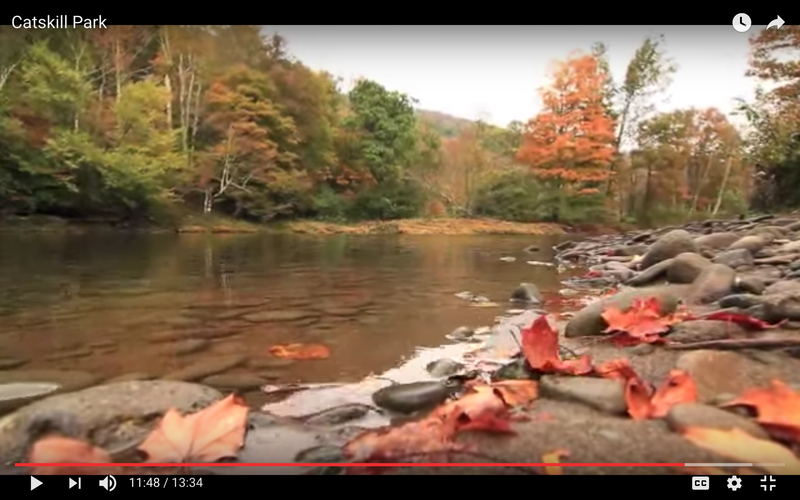 Water filtration, pollination, air purification… nature used to do it all for free. Now the emerging field of “ecosystem services” aims to put a price tag on our natural resources. Are capitalists the new conservationists? If you started at scenic Bethany Beach on the Delaware shore and drove due west on Route 26 for 10 miles, you’d hit the town of Dagsboro. Pass through town, drive a few more miles west, and you’re in Cypress Swamp Forest Legacy Area. This clunkily-monikered chunk of land is one of the last remaining swaths of forest in the state. Last year, the land’s owner, a timber company, sought to sell the property. Normally, it would have been snapped up by a developer looking to pave it over with housing subdivisions. This, after all, is one of the fastest growing regions of the state, and housing developments bring in more money than timber. Instead, however, the land was purchased by a Maryland-based group of investors who plan to turn a tidy profit another way: by doing nothing. Actually, “nothing” is an oversimplification. First, they are going to restore the land — which has been ditched, drained and leveled by its timber masters — and return it to its original swampy glory. Then they’re going to do what conservationists have been imploring society to do with wetlands like this: leave it be. And for their pains, these new-style businessmen expect to reap the same kind of financial returns as if they had invested their millions on Wall Street. Since Adam Smith wrote his famous tract, capitalism has maintained land has no value until it is put to use by humans — which is why wetlands, prairies and forests have been drained, paved over and cut down in favor of shopping malls, office parks and suburban homes. Much to the dismay of conservationists, calls to leave nature alone haven’t held much sway when there’s been a buck to be made. Now, however, thanks to an emerging field called “ecosystem services,” it’s beginning to look like there might actually be a buck to be made by letting pieces of land — or, more specifically, the ecosystems they contain — remain pristine. Ecosystems, say proponents of the new thinking, perform real work that has bottom-line value to human economies — work like filtering drinking water, pollinating crops and (the service most people are probably familiar with today) controlling climate. In many cases, they say, nature can do the work more cheaply than any man-made solution. In light of this new understanding, communities and businesses are taking a second look at nature, figuring out how it plays into their bottom lines, and in some cases, rejiggering their business practices and investing in conservation as a result of their discoveries. The field is still nascent and its application scattered. But one of the strongest signals to date that this could be the wave of the future came in 2005 when Wall Street behemoth Goldman Sachs announced that, as part of a wide-ranging environmental strategy, it would fund research into how to valuate the services generated by forest systems. “It’s an indicator of where things are going,” says Davis. The ideas have been around for a while, but they started gaining momentum a decade ago. In 1997, a group of ecologists, biologists and others became concerned that even those who did hold affection for the spotted owl or backwoods camping trips did not fully appreciate nature’s contribution to human economies. So they published a book called Nature’s Services: Societal Dependence on Natural Ecosystems, which details the dozens of natural functions that can be tabulated on a balance sheet. In addition to water filtration, pollination and carbon sequestration, other services include flood protection, fish and timber production, runoff protection, recreation, waste management and air purification. Later that same year, a team led by University of Vermont ecological economist Robert Costanza quantified the actual value of all that work. The final tally? $33 trillion — more than the entire world GNP at the time. That figure — and the fact that it could be calculated at all — caught the attention of business people and policy planners alike. Now, a ground-level shift is taking place. Instead of ignoring nature, or worse, paving it over or polluting it, some communities and businesses are realizing it’s sometimes in their interest to conserve nature — so they can turn around and “hire” it to perform certain much-needed services. New York City, for example, decided to invest in maintaining the Catskills Mountain watershed because using it to filter their drinking water was at least 80 percent cheaper than building a new water plant. Similarly, when authorities in Seattle’s King County were short of funds to repair levee systems, they turned to nature for help, creating a plan to restore floodplains and let nature do the work of taming floods. And Wal-Mart and Japanese car manufacturers that ship goods through the Panama Canal are funding a project to pay neighboring landowners to restore and maintain forests on their lands. The forests will serve the businesses by reducing soil erosion and the resulting silt buildup in the canal, which in turn will cut the insurance premiums the corporations pay to protect their barges against business delays caused when the canal closes for dredging. In each of these arrangements, the customer benefits by getting a specific service out of nature. But conservationists are also benefiting by getting what they have been seeking all along: restored habitats and a reversal of environmental degradation. Along with the excitement about the new paradigm, however, is a new sense of urgency, driven by the realization that some services provided by nature might not actually be around much longer. For some, like flood protection, waste management or pollution, the alternative will be expensive man-made solutions. But for others, like carbon sequestration, there is no meaningful technological alternative. In 2005, the United Nations made an alarming pronouncement: 60 percent of the services provided by nature, it said, are being degraded faster than they can be replaced. “The ability of the planet’s ecosystems to sustain future generations can no longer be taken for granted,” the U.N. said. The culprits are human. On the one hand, today’s exploding populations require more services than when there were fewer of us on the planet. At the same time, there are fewer ecosystems altogether to provide the services. Human activity has destroyed ecosystems directly, through the conversion of land for other uses, and indirectly, through pollutants. Public policy leaders are now considering new rules — and in some cases instituting them — to reverse the destructive trends. From that new regulatory environment, new business opportunities are arising, principally in the form of credit schemes. Businesses or government authorities that can’t meet the new standards “outsource” their compliance by buying credits from others. The most well known and mature of these are carbon markets. But markets for other natural goods, like wetlands and particular kinds of habitats, have also emerged in various parts of the country. If Adam Davis’s vision comes true, these will become the primary mechanism for creating large-scale conservation. “The more we align meaningful return on investments to meaningful conservation results, the more conservation we’ll produce,” he says. How Much For That Mountain? Though seemingly promising, credit schemes, also known as environmental markets, are still in their infancy. “It’s still very much the vanguard companies that are willing to take a small risk,” says Emma Stewart, director of Environmental Research & Development at Business for Social Responsibility, a nonprofit business association that advises members on socially responsible business solutions. Before environmental marketplaces become more commonplace, basic market mechanisms — the foundations of any efficient economy — will have to be created: Easy ways for credit buyers and sellers to find each other; enforcement mechanisms to ensure conservation is being delivered; common ways of measuring units of damage and units of conservation; and efficient pricing systems. Gretchen Daily, a Stanford ecologist and the editor of the landmark Nature’s Services book, is working on that last piece. In 2006, Stanford’s Woods Institute, where Daily is a senior fellow, joined forces with the Nature Conservancy and the World Wildlife Fund to create the Natural Capital Project, which is developing tools for measuring the services specific ecosystems provide, determining what they’re worth, and identifying who’s benefiting from them. E.B. Boyd is looking forward to the day when she gets paid for the climate control services performed by the giant Monterey Cypruses in her backyard. BRIDGEVILLE — A national resort company yesterday announced its plans for a $100 million resort, spa and indoor water park in Sullivan County. The Sandstone Resort at Hudson Valley would be located just off Route 17 in Bridgeville and would feature 350 rooms and suites, a 60,000-square-foot indoor water park and a high-end spa. The project’s developer, American Resort Management, said it would create 250 jobs. Richard Coleman, senior vice president of the company, said the location is ideal because millions of potential customers live within a three-hour traveling radius, especially in New York City. “We want to have a throwback to the glory days of hospitality in that region,” Coleman said, evoking the Catskills’ heyday as New York’s top resort destination. The project already has attracted investors, but Coleman said those details will be announced in the future. Sullivan County has a healthy skepticism about projects this large, given the recent history of multimillion-dollar plans that never come to fruition. American Resort Management is working with Bridgeville USA LLC, a partnership that owns the 18 acres off Exit 107. Bridgeville USA’s investors include Charles Petri and Gene Barbanti, who failed in a business venture with the Unkechaug Indian Tribe a few years ago. Working with the Tribe, Petri and Barbanti wanted to install a casino and high-stakes bingo parlor at the run-down Apollo Mall in Monticello, court papers said. The gambling plan ultimately failed, in large part because the Unkechaug are not a federally recognized tribe. Financial disputes eventually pitted the tribe against Petri and Barbanti, both of whom were absolved of any wrongdoing in court. Now the two men are back, with partners that have considerable experience. American Resort Management owns or manages 13 resorts, water parks and restaurants across the country. The company said it will contract with Hy-R Building Systems in Liberty, where Barbanti is a managing partner. He and Petri could not be reached yesterday. Assuming the project is approved by the town, American Resort Management said it would break ground this fall and open in summer 2009. BRIDGEVILLE – A 350-room indoor destination resort with a 60,000 square foot water park and family entertainment sphere was announced Monday by Bridgeville USA LLC. The company plans to build the facility, which anticipates employing 250 full- and part-time people, on 18 acres off Rt. 17 exit 107 in Bridgeville. The project has been dubbed Sandstone Resort at Hudson Valley, but as it develops, owners may adopt the Catskills Region imagine for marketing purposes. “Indoor water parks are becoming very common in many areas of the country. Their popularity is largely based on the family-friendly getaways that can be had relatively close to home every day of the year in a beautiful 84-degree setting,” Richard Coleman of American Resort Management, the company chosen to operate the facility. The company hopes to break ground this fall and open in the summer of 2009. Coleman said they are about to start seeking the local planning approvals for the project. Citizens Against Government Waste published its annual list of congressional earmarks (they actually call it the Congressional Pig Book list). Of course, what one person calls wasteful spending, another person calls bringing home the bacon, and now that Democrats are in the majority, New York was supposed to be getting more federal money. The state made out with a good portion, particularly in the Catskills, where Maurice Hinchey brought in $43.7 million. Story and photos by James MichaudI guess the short version of this setup is that these days, it’s getting more and more difficult to find “places” rather than brand outposts. And it’s not just cities and suburbs; ski areas are moving in this direction too. Meat-and-potato skiers who prefer atmosphere to amenities are getting increasingly disenchanted about the fact that many of today’s mountains seem to be increasingly dedicated to one thing –separating guests from their discretionary income. But with snowmaking and other costs pushing the number of “lost” ski areas here in the northeast into the mid three figures, realists also have to come to terms with some unpleasant truths. To survive in today’s winter sports industry often involves signing a kind of Faustian pact in which your operating model needs to include people who had never patronized the mountain before. And the people with the kind of money that supposedly help a mountain’s bottom line expect more than just snow, chairlifts, and a lodge. They want amenities: restaurants, slope-side accommodations, activities for non-skiers, après ski, four-season attractions, etc. The trick is to attract those new visitors without alienating the people who kept you going during the lean times and liked things the way they were. This is the challenge that Belleayre Mountain, 2.5 hours northwest of New York City, has been wrestling with for the past eight years. Since taking over the reins of Belleayre a decade ago, superintendant Tony Lanza has revived this previously underperforming ski area by concentrating on East Coast fundamentals: snowmaking, grooming, improving uphill capacity, a long-awaited terrain expansion, and this spring, breaking ground on a 24,000-square-foot day lodge. During this time, Lanza has established a reputation as a talented manager. Go through as many ski forum threads as you want, it’s tough to find even one post saying anything remotely critical about the way he maintains Belleayre’s snow and infrastructure. But beyond that, some feel that his most important accomplishment may be less tangible – the fact that he’s developed a resonant marketing storyline that concentrates on what the ski center has to offer, instead of dwelling on what it lacks. Belleayre’s sun deck in mid-April. So while you won’t find 2,000 vertical feet of steeps or untracked knee-deep powder on a regular basis, what Belleayre provides is something that’s become a rarity in the ski business east or west: a back-to-the-basics vibe unpolluted by “progress.” As you stand along the ridgeline looking out over the rounded, undeveloped mountains of the western Catskills, what you see today isn’t substantially different from 1949, when New York State’s first chairlift was installed. In fact, a recent PowerPoint presentation for the ski area featuring a photo from the late 1940s juxtaposed with a recent shot shows that, in fact, very little appears to have changed over the past 60 years. How many ski areas can you say that about? After decades of getting the short end of the state largesse stick while Gore and Whiteface in the Adirondacks reaped high-speed lifts, gondolas, and other niceties, this perennially overlooked ski center is taking its first steps to becoming a full-fledged resort. In fact, Belleayre – the same one that used to draw barely 70,000 ski days a year, the same one that was almost closed in the 1980s as a cost-cutting move by then-Governor Cuomo – is being positioned to become the economic engine for Ulster County. But like most things in life, nothing is simple. So sit back, relax, go to the kitchen and fix yourself a sandwich, because this story has a lot of twists and turns, a fair amount of emotional, legal, and political drama, and it ain’t finished yet. But before we get started with that, let’s take a look at Belleayre’s nuts and bolts. Click image to open a full-size Belleayre trail map in a new browser window. Belleayre is a bit of an odd duck terrain-wise. To arrive at the rustic 53-year-old Overlook Lodge, you drive up to a large parking lot that cuts directly across the middle of the mountain. This feature was created in the 1940s before the arrival of snowmaking to take advantage of the better snow preservation at the top of the hill. Above the parking lot are two fixed-grip chairs that bring you up a little less than 1,000 vertical feet to a flat ridgeline. All of the trails that meander down from the summit start off with a short steep drop and then twist through the trees as blue runouts. Cautious early intermediates can get off mid-station and skip the upper sections, several of which are allowed to develop VW-sized bumps. By skating in either direction along the ridge, you can access a bunch of prototype tree-lined East Coast trails like Peekamoose, Algonquin, Esopus, Pepacton, and never-groomed Utsayantha. On the western edge is one of the newer trails, Dot Nebel, which started off in 2001 as a narrow rollercoaster ride, but over the past five years was broadened (to its detriment, in my opinion) to become Belleayre’s widest single trail and a principal racing run. 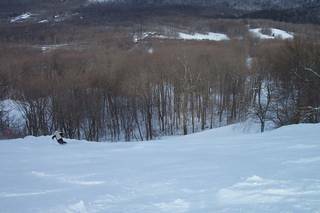 Off the high-speed Super Chief Quad, lower-level skiers can turn east to cruise down Roaring Brook, Onondaga, and Horseshoe Pass, while bump-lovers can try Belleayre Run and Tongora with steeper moguls up top and low-angle mounds further down. On either end of the property are winding blues that allow you to glide along slowly and admire the gentle Catskill scenery. It’s the tree skiing that makes Belleayre a surprisingly good choice after a dump of lake-effect snow. You don’t hear much about it because, with the exception of the marked glades alongside the Super Chief and Tomahawk quads, most of the trees aren’t officially open for skiing. But if you’re in a poaching sort of mood, along the west side of Dot Nebel is a pitch-perfect woods run that practically no one bothers to venture into. In fact, between most of the upper mountain trails you can sniff out short tree shots that provide lots of sweet low-angle powder turns. If you’re feeling more adventurous, traverse uphill to Cathedral Glen – recently voted one of the Top Ten expert glades in the East by Snow East Magazine – for a little bit of Mad River Glen in the Catskills. Another terrain selling point is Belleayre’s ability to physically separate beginners from advanced skiers. Below the Overlook Lodge are a handful of tree-lined trails with their own dedicated lifts – a perfect place for lower-level riders to do their own thing without knocking heads with more experienced riders. Add to that very reasonable daycare services, inexpensive beginners lessons, lots of day-ticket discounts – including buy-one-get-one-free, a handful of $15 Skier Appreciation Days, and five straight weekdays during its annual Winter Festival at $10 per person – and you’ve got a ski area that earns its family-friendly reputation. Moreover, Gotham-based skiers and boarders can catch a bus from the Port Authority in midtown Manhattan for only $68 per person, which includes your lift ticket. If you consider today’s gas prices and tolls, that’s a deal. Like any ski region, each Catskill area has developed a clearly defined target audience. If you want more amenities, a better park, real food, and mostly intermediate-level trails, you head for Windham. If you want a bare-bones retro experience with a better chance of fresh tracks after a storm, Plattekill’s the call. Those who prefer steeper, more sustained terrain take their business to Hunter. Belleayre’s Snowsports Director Don Boyce on the Algonquin trail. Belleayre’s old-school feel, cozy, tree-lined trails, and nice selection of bumps have made it the choice for people who want a relaxed day at a ski area that, until recently, flew under everyone’s radar. Moreover, its ability to spread out crowds has always meant that it’s a great option for weekend warriors trying to avoid lift lines. Even on a mid-winter Saturday, you can often ski right onto Lift 7 or the Tomahawk quad. In particular, the trails between those two upper lifts always seem to be relatively deserted. That said, positive word of mouth about Belleayre means that it’s not quite the quasi ghost town it used to be on peak weekend days and holidays, especially in the increasingly cramped day lodges. No question, conditions in the Catskills can be, ahem, “challenging.” Depending on the day you go and the weather that just came through, you might get anything from teeth-rattling hardpack and icy moguls to beautiful groomed runs, to a foot or more of powder from lake effect storms that dump most of their load on Belleayre (while ski areas to the east generally get sloppy seconds). But with end-to-end snowmaking and attentive grooming, Belleayre provides what many believe to be the most consistent conditions in the Catskills. While Belleayre only averages about 150 inches of snow annually, when I had the ability to pick and choose my days last year, it was surprising how many times I brought along my fat skis. 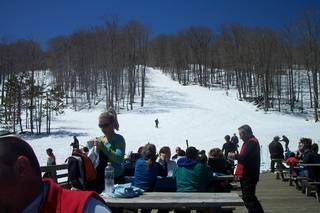 Although the 2006-07 season got off to a miserable start everywhere in the northeast, once winter arrived toward the end of January, Belleayre got tagged a bunch of times and had beautiful coverage all the way through the third weekend of April. This season has been all over the map with lots of rain events followed by hard freezes. That said, the on-piste conditions for all but one of my days there were much better than I had any right to expect – a testament to the grooming team’s skills. They certainly weren’t getting much help from Mother Nature. A nice extra for lost ski area fans can be found by scooting skier’s left from the top of the Tomahawk Lift to Deer Run, with its view of Plattekill in the distance. At the 90-degree right-hand turn about two-thirds of the way down – where the sign tells you about the boundary of the ski area – taking a hard left and gliding across 100 yards of trees puts you at the top of long-abandoned Highmount. 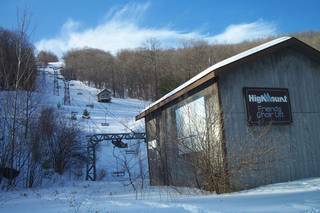 Closed since the 1993 season, Highmount is a great place to score lift-accessed runs through a deserted winter playground. With the encroaching raspberry brambles, a dilapidated Borvig double chair (bought in the 1980s from Jiminy Peak), and an old t-bar, about the only thing missing at Highmount are tumbleweeds. While parts of some slopes are tough to negotiate due to thickets and blown down trees, several of the 1,000-vertical-foot trails are still surprisingly skiable with enough coverage. From the bottom, you can hoof it back to the Tomahawk lift (maybe a mile), drive back in a car that you spotted there in advance, or hitch a ride if someone drives by. Last year’s Valentine’s Day storm – the one that dumped more than two feet of dense pow – was my most recent opportunity to take a few runs down Highmount, and it didn’t disappoint. After veering left at the top of the t-bar, I cruised alongside the old Friends double chair through soft, knee-deep snow. Once I got to the bottom, I checked out the rusting remains of the lift shack, followed by my obligatory stroll around the old lodge and rental shop. Everything was still sitting in its place from the area’s final day of operation in April of 1993: lift passes with photos, rental skis and boots, snow reports, brochures. It’s a creepy feeling, like visiting the ghost of skiing past. Over the years, every time I snuck over to Highmount, I thought about how great it’d be if Belleayre would just annex the damn thing – mow down the trails, install a fixed-grip lift, throw up some snowmaking guns, and open it up again. After years of being told that it would never happen (mainly because the state didn’t own the property), it looks like this wish now stands a good chance of being fulfilled. 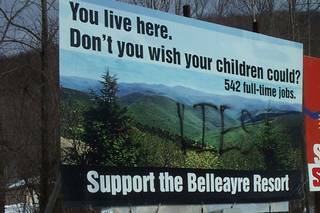 But the 78-acre ski area is now part of a much bigger narrative: the Belleayre Resort. As mentioned earlier, one of the unique things about the Catskills is that even though it’s only a couple of hours away from millions of people in the tri-state area, it’s a region that corporate America seems to have largely forgotten. Like falling down Alice’s rabbit hole, as you drive west on Route 28 between the New York State Thruway and Margaretville, it often feels like you’ve stepped into a time machine to the late ’60s, before chain stores had invaded our lives. Of course, another way of looking at the situation is that the region has been hurting economically for decades now, and that residents who aren’t sitting on nest eggs earned in the big city find it tough to make a living. As businesses and restaurants sit vacant with for-sale signs and homes fall into disrepair, it’s pretty obvious that this stretch of the Catskills (and much of the entire region, for that matter) needs help. It’s especially painful for older residents who remember a time when the Catskills had a booming tourist and hunting economy with thousands of hotel rooms and an infrastructure to serve all those visitors. For Belleayre, this lack of commercialization is a double-edged sword. The mellow, non-corporate atmosphere is a big reason that people choose to ski there rather than at a condo-lined resort. But with just a few dozen B&Bs and scattered small hotels providing most of the nearby accommodations, it was obvious that Belleayre would never break out of permanent day-trip mode and contribute to the economy of the region – the main reason the state went into the ski area business in the first place. Transforming Belleayre into a full-service, four-season resort is seen by many as the best way to get the region back on its feet. Enter Crossroads Ventures, which over the past 10 years has worked to green-light a massive development plan featuring hotels, a golf course, hundreds of lodging units, a conference center, a spa, and a reopened Highmount ski area. After years of back-and-forth between Crossroads, the state government, the Department of Conservation (DEC), environmental watchdogs, New York City watershed regulators, and local activists, in September, former New York governor Spitzer officially announced a pared-down environmentally sensitive development. At the same time, he declared that the state will purchase and preserve 1,200 acres of land in the Ashokan Reservoir watershed. Crossroads asserts that Belleayre Resort will provide 450 desperately needed full-time permanent jobs, 1,800 construction jobs over an eight- year period, $4 million a year in property and sales taxes, and lots of trickle-down income to secondary businesses. Given the way things have been going for this region, a potential injection of capital like this could be a lifesaver. But while the ski area has quietly positioned its own long-overdue growth (new lifts, expanded terrain, a 24,000-square-foot day lodge, additional snowmaking) as a “gradual, peaceful, progressive, evolution,” the negotiations between the other players have been anything but peaceful. Large numbers of residents welcome the revised project as a template for intelligent, sustainable growth and an opportunity to kick-start the economy. At the same time, vocal opponents claim that most of the jobs generated by the 663-acre resort would be low-paying and that only the developer would benefit. They also argue that the resort would – and this is an abbreviated list – despoil a well-preserved wilderness area, pollute streams that supply the New York City watershed, clog roads with traffic, and lead to unwanted development on additional properties owned by Crossroads Ventures. So like most large development plans that have the potential to impact a fair amount of people, not everyone is on the same page. Adding to the brouhaha, with New York State planning to invest an estimated $47 million in taxpayer money to expand and upgrade Belleayre, advocates of privately-owned Windham and Hunter in neighboring Greene County allege that they’re competing on an uneven playing field, claiming they’re forced to pay an array of taxes, insurance premiums, and other operating expenses from which Belleayre Ski Center is exempt. The fact that Belleayre often blows artificial snow late in the season (when Windham and Hunter can’t afford to do the same) and offers less expensive lift tickets is further proof to them that the state is favoring its ski area to the detriment of the privately-owned mountains. So what’s the deal – is Belleayre drawing on, as chairman of the Greene County Legislature Wayne Speenburgh recently argued, “A bottomless pit of money they don’t have to be accountable for” or is it simply out-marketing neighboring ski areas and providing a more attractive product? As details about the expanded ski area continue to be debated, a glimpse of the planned resort may be found about 12 miles east of Belleayre on Route 28. There, the Emerson Resort, a luxury hotel and spa with two restaurants, blends discreetly into the Catskills landscape. It was developed by local entrepreneur Dean Gitter, principal of the same Crossroad Ventures that plans to develop the Belleayre Resort. The deluxe Inn features 25 luxury suites and all sorts of high-end spa treatments – needless to say, it ain’t a cheap date. Food- and drink-wise, there’s a comfortable bar with a good beer selection and a restaurant specializing in Asian-based cuisine. In a separate building, the atmospheric Catamount Café looks out onto Esopus Creek and has a well-appointed, but laid-back feel that blends in well with the surrounding countryside. Over the last five or six years, I’ve had some excellent meals there. The Lodge next door has an upscale log cabin feel with somewhat more reasonable prices. I’m neither a hotel critic nor an environmental engineer, but the overall resort appears to be well-run and relatively unobtrusive. As you stroll around the property, employees and management don’t seem to be part of a radical movement to desecrate a rural region or participants in a get-rich-quick scheme at the expense of locals. Several of the employees I spoke to claimed to earn wages that are above average for the region. One has to wonder if the proposed Belleayre Resort, with the massive oversight of the state, a bunch of environmental groups, and the New York City water authority would have any different aesthetic, economic, and ecological impacts on Ulster County. Or is that like comparing a small apple to a gigantic orange? At the time of writing, the future of the ski area and the planned resort is still being hammered out. Will people accustomed to a mellow “unbranded” ski center in the middle of a wilderness area adjust to a destination resort? Why did the state recently torpedo three miles of planned trails on the Belleayre’s Cathedral Glen section? Can the ski center improve its experience without eliminating what makes it unique? Will the rural character of the region be overwhelmed? Will the local economy benefit? 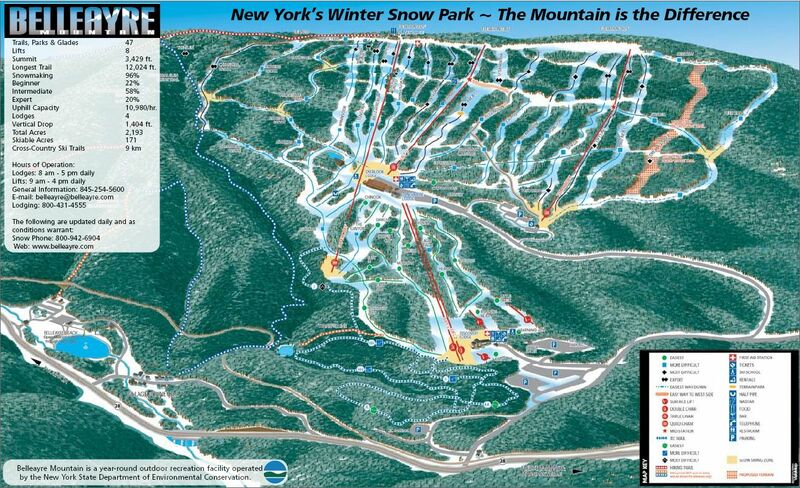 And lastly, why can’t the three ski areas just work together, for chrissakes? Your guess is as good as mine. Midstation on Belleayre’s Tomahawk lift evokes a ski area from days gone by. While the Hatfield-McCoy drama surrounding the ski center’s eventual expansion continues to boil over, it’s helpful to take a step back and ask why many New Yorkers are passionate about Belleayre, despite it not having the biggest, deepest, steepest, longest, or most expensive anything. For that, you might want to check out the guy at the Tomahawk Lift mid-station. Instead of a bored post-teen with tattoos, lip piercings, and bad skin, you’ll find a cheerful older gent who clearly seems to enjoy his job. 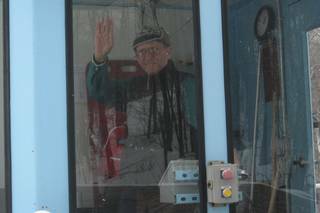 If you’ve ever skied there, I’m sure you’ve seen him – he’s been there for years. I couldn’t tell you his name; all I know is that he blasts classical or opera music from his hut while waving and smiling at people on every single chair that goes by the entire day. He seems to have a great time whether it’s sunny or cloudy, dumping snow or pouring rain, ten below zero or in the low 50s – and his enthusiasm is contagious. Even hard-bitten New Yorkers have been known to smile back at him. As Belleayre moves into the next phase of its existence – one that regulars are worried might transform the ski area into something they don’t recognize – it would do well by holding onto a guy like this. Highmount, NY – When you go back to visit your childhood neighborhood or a town where you spent part of your earlier life, things are rarely the same as before. Change or “progress” has occurred. The family-owned dairy that made and sold its ice cream on-premises has been razed and replaced by a Chili’s. The forest where you cut bike trails as a kid (before there were mountain bikes) was bought by a developer and transformed into a subdivision filled with identikit houses. The baseball stadium where you used to watch the hometown team is now named after a supermarket chain, bank, or soft drink. Maybe it’s different for you, but that’s my story and I’m sticking with it. Up in Delaware County right now, days are getting longer, the fish are jumping and trout season is officially here. The wilderness hike is at its best now — brisk, sunny and solitary, with that incredible “slanted” spring light that has inspired generations of painters and writers like Roxbury’s very own native John Burroughs. With thousands of wooded, hushed acres to wander, you can actually hear yourself think as you take in the earliest songbirds and trace the shadows of the hawks’ wings. OK, the hiking may be wonderful in the Catskills but leaving all of civilization behind is not always a good thing. At the chic-fab Roxbury Motel (www.theroxburymotel.com), all the best of now has landed right in a romantic, historic mountain hamlet. Recently featured on NBC’s Today show as one of the “hottest trends in travel” (view video here) (http://www.theroxburymotel.com//Press/video/NBC-News.php), The Roxbury offers award-winning “wow factor” theme rooms and suites (www.theroxburymotel.com/Rooms/), heavenly pillowtop mattresses, DVD players, microwaves and fridges, 100% Egyptian cotton linens, luxurious “Lather” bathroom amenities, and free wifi in every room. Wake up to freshly-ground Hawaiian coffee served with freshly-baked aromatic coffee cake, fresh fruit, muffins, croissants, pumpkin seed cereal, and so much more in the extensive complimentary breakfast. And The Roxbury’s Shimmer Spa (www.theroxburymotel.com/Rooms/Rooms.phtml?spa) will soak and soothe all those winter aches away. And, just in time for the awakening of Spring, The Roxbury is now offering a limited-time, once-in-a-year savings: a loaded hiking package for twosomes that starts at $385 for a whole weekend (that’s $100 off regular season rates) and for $685, you can spread out in an opulently appointed fantasy suite — complete with Genie’s bottle soaking tub — for you and your four hippest friends (that’s $200 off regular season rates). But “think spring” because these deals only last through May 22, 2008. The Roxbury’s “Thank that Spring” (www.theroxburymotel.com/Promotions) package supplies all the gear needed to enjoy the great outdoors with panache and no panting (enjoy a complimentary “high sierra” hiker’s backpack, stuffed with a flask of fine Bordeaux, a two-person lunch or an assortment of cool cheeses) along with maps and a planned itinerary for a great hike based on skill level and “enthusiasm” for exertion. Take a pick from such spectacular treks as Giant Ledge Hike and its breathtaking panoramic views of the rolling peaks of the Catskill Mountains, Kelly Hollow Hike and its awakening flora and fauna, Alder Lake Hike with its sparkling water and idyllic lakeside picnic spots, or up the stone steps to Roxbury’s railbed hike tracing the historic footsteps of the Native American Lenape, or Kaaterskill Falls Hike and the roar of its series of dramatic waterfalls. Even in the hamlet itself, the East Branch of the Delaware River winds through the elegant expanse of Kirkside Park, through the village and then through the back yard right outside the rooms at The Roxbury (there goes that water supply!). Once back from a day of adventures, enjoy an indulgent yet educational two-hour couples’ massage as well as 2 complimentary passes to use The Shimmer Spa throughout an entire stay. Cozy up at night with any of The Roxbury’s 400 DVD film collection (including the AFI’s 100 best movies ever made). For the outdoorsy types wanting to add even more verve to their package, you can wake up the next day and check out some of the most challenging mountain biking in the Northeast at Plattekill Mountain, just five minutes away. Or rent some bikes and cycle the day away on the meandering 27-mile Catskill Scenic Trail which starts right outside the village of Roxbury. Add more fun and glam to your package with a 3-course tasting menu for two at the award-winning Peekamoose Restaurant (only $90) or turn the whole weekend into a “Groovy Girls Night Getaway” or “Rad Romance” package (see http://www.theroxburymotel.com for details). Or you can go for a more “back to nature” bare bones package without the extras like the massage and save even more!